The Acer's Iconia Tab we are going to review today is an 8-inch Windows 8.1 tablet available for around $80. The tablet features the same hardware as the competition: a bright IPS screen, a Bay Trail processor, 1 GB of working memory, and 32 GB of storage capacity. This is a 2015 model so it’s not the newest tech you can find in the tablet’s world but with current sales you can get it at less than $80 which is a definite bargain. The casing of the Iconia Tab is made of white plastic. A silver-gray plastic rim that gets wider toward the tablet's upper edge envelops the narrow sides. The device's back features a grooved texture. The tablet's weight adds up to 406.3 grams, and it shows good, strong build. The interfaces of the Iconia Tab are identical with those of HP's Stream 8 5900ng and Dell's Venue 8 Pro 3845. On the upper edge you have a micro-SD card reader, micro-USB, combo audio. On the right there are the power button and the volume control. 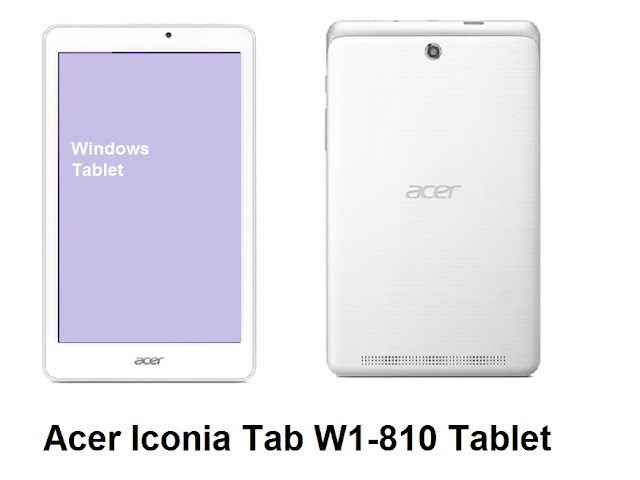 The Iconia Tab has a Wi-Fi module from Broadcom that supports the 802.11 a/b/g/n Wi-Fi standards. In addition to the Wi-Fi module, a Bluetooth 4.0 chip is also installed in the tablet. You also get 2 cameras – front and back – each of 2 MP resolution thus primarily suitable for snapshots. The operating system is the Bing version of Windows 8.1 (32-bit), available pre-loaded on the Iconia Tab. Additionally, a one-year license for MS Office 365 Personal is included on the tablet. The license has to be activated within a specified time or it will expire. MS Office can be used on both the tablet and a laptop/PC. The capacitive touchscreen of the Iconia Tab supports 5 touch points and responds instantly to inputs. The small icons and buttons are hit very accurately after a while when the tablet is used in desktop mode. The 8-inch screen in the Iconia Tab has a native resolution of 1280x800 pixels. It can boast with a good brightness. The contrast and black level are decent and are on par with the rates of HP's. Acer has also treated the Iconia Tab with an IPS screen so you can read the screen from every position. It is possible to use the tablet outdoors, though the device has to be placed in a position that prevents reflections. The device's computing performance is strong enough for office and Internet applications. In addition to apps from the Windows Store, it is possible to run desktop applications on the tablet. The device renders Full HD videos without problems. Like most 8-inch Windows tablets, the Iconia is also equipped with an Atom Z3735G quad-core processor. The processor operates with a base speed of 1.33 GHz, which can be increased up to 1.83 GHz via Turbo. The Iconia Tab only has a working memory capacity of 1GB - not very much for a Windows computer. That is not noticed in routine use; the touch interface runs smoothly. The low working memory capacity however might be noticed when using desktop applications. The Iconia Tab's storage capacity is also identical with HP's Stream 8 5900ng and Dell's Venue 8 Pro 3845. All three tablets have a 32 GB eMMC storage module. The transfer rates of the module installed in the Iconia are on a standard level for an eMMC storage. However, you will have roughly 18.4 GB of the 32 GB available in state of delivery. The remaining storage capacity is divided between the Windows installation and recovery partition. The storage capacity can be extended via a micro-SD card should it get tight. The Iconia Tab - just like similar tablets from the competition - is made for games that are available in the Windows Store. These titles have been developed for "weak" hardware compared with Core processors. Sophisticated 3D games like The Crew or Far Cry 4 cannot be played. The Iconia Tab lasts for a bit over 12 hours in idle mode and under heavy load, would last around 2 hrs 30 mins. For this class of tablet, Iconia Tab's battery life is acceptable but nothing impressive.